A pure skill based PVP action shooter. 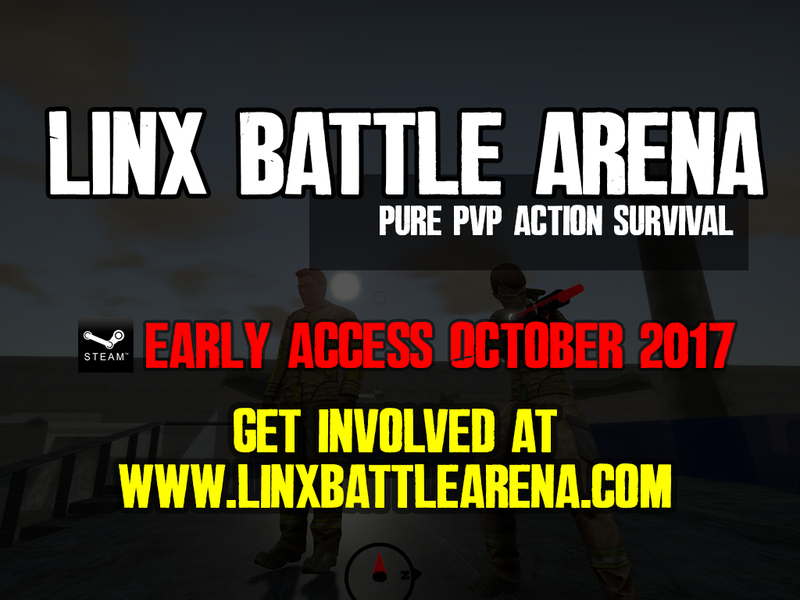 LINX BATTLE ARENA takes the online survival game in a new direction with this fast paced, action based Third Person Shooter. Starting with 1 half empty hand gun and limited health, you will always be aware of how vulnerable you are. Play private games v friends or join public open games to dominate the arenas. Linx Battle Arena will be like no other game you have played before - you will constantly be looking and listening for your enemies weak points, ready to exploit them to gain the advantage and pick up that extra coin box from their dead body. You are never secure, never in a position where you know you will survive the next shot. No teams - every other player is out for their own glory. Set up or join a lobby and play in timed skirmishes (5, 10 and 15 minutes) or play with up to 5 lives per skirmish. Games can be set up to have gun vendors where you will buy specific guns with your recovered cash, or have 'lucky dip' gun vendors where you are given a free random gun each time you need a reload. Select your character and enter a private lobby with friends or join a public lobby to compete against other players from around the world. Start with a single handgun and work your way through a selection of rifles and explosive weapons by collecting cash boxes from around the arena. Having the best gun wont always save you as you only ever have 1 clip and limited health so you will always be very aware of how vulnerable you are. Lives and games are timed and saved on the online scoreboard for bragging rights. Show off your skills with ranked badges and icons shown above your name on player lists and score boards. Weekly winners will enter the LBA hall of fame for all to see on the LBA website. 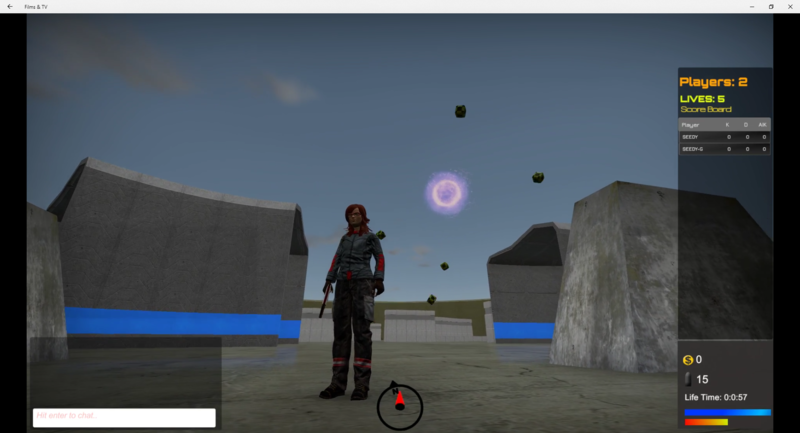 In the past 2 weeks we have been testing like crazy in Linx and come up with a new map, a new set of weapons which will soon be modular and a new gun distribution system. The old weapons were good.. they worked very well but they looked CRAP! So I binned all of them and designed a new semi modilar set of weapons that will allow players to select what attachments and type of weapon they prefer. this is still WIP but for now I am allowing fully built weapons to be purchased from the gun vendors. We have been testing these allot over the past 2 weeks and my testers love them! I have added a new BullPup shotty type weapon which is a perfect CQB weapon but as you would expect is pretty lame at long distances. I have built in a new coin distribution system that will move the flow of the matches around the Arenas. Once the match starts, coin distribution orbs will appear around the arenas which after a set amount of time will blast out up to 15 coin boxes. If you want cash for guns you better get there quick to pick up your bounty. Coin boxes give out random amounts of cash to spend in the gun vendors. You can still of course kill your opponents and steal there money from there dead bodies! I have added the old Quad bike back to the game but gave it a pretty major overhaul. the cost of driving the quad is significantly lower as well so you wont loose allot of your hard earned cash while driving plus running over people while they try to run away is so much more fun now! We have been also testing joist type battles with the quads which is crazy! Driving your quad at full speed head on gives some crazy results! 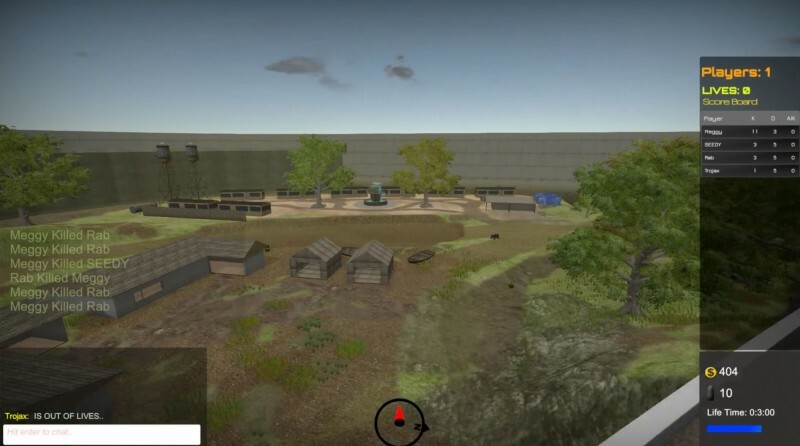 In the past week I have built a complete new arena which is a semi Park Land/Rural setting. The park is built around a central 2 story house which gives snipers great scope for seeing everything that is going around the map but as the windows can not be shot out, the sniper can see allot but not shoot out in every direction. As I move closer to Early Access, I will be working on removing any bugs I find (which now are few and far between!) and looking to work on a new features as suggested by my game testers. Early Access Release date set on Steam! Early Access is drawing closer with the date set to 4th October. Get in to Linx Battle Arena and direct the game to your liking.